I typically don’t take a militant stance on anything because we all have different goals, circumstances, backgrounds, and financial situations. However, there is one thing about which I am a vehement, diehard evangelist and I’ll rage on if given half the chance. This lightening rod issue that’ll cause me to shed my otherwise accepting, egalitarian self? Leftovers. There is only one appropriate way to deal with leftovers: by eating them. You can freeze them, store them, save them, or consume them the next day, but they must be eaten. Short of a leftover possessing a known food-borne illness (and it better be a bad one), leftovers are never to be thrown out. I know this is extreme. I know it’s hardline. I know this isn’t the normal, non-judgmental Mrs. Frugalwoods, but people, we have a serious food waste issue in this country. And, as so often happens with waste, this blatant disregard for our natural resources translates into a very real drain on our finances. 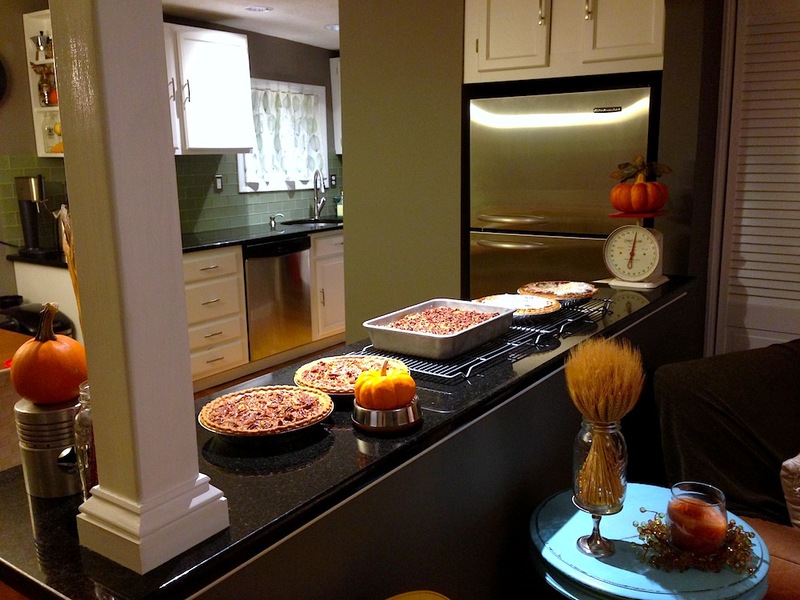 Thanksgiving, which we Americans celebrate later this week, is a holiday nearly synonymous with leftovers. And often, these leftovers are heralded as welcome components of the festivities. For the past three years, Mr. Frugalwoods and I have hosted his family for Thanksgiving, which we absolutely love doing. Mr. FW cooks up a big ol’ turkey along with homemade cranberry sauce, gravy, biscuits from scratch, a shredded brussels sprout salad, sage sausage stuffing, and hand-mashed potatoes. I bake pecan pie and pumpkin cake along with his family’s traditional Shoo Fly Pie, which we eat for breakfast. It’s a panoply of incredibly delicious foodstuffs and we cleverly repurpose all of it into leftover meals for weeks. Chiefly, we eat the Thanksgiving banquet for the entirety of my in-laws’ visit–every lunch and dinner is comprised of Mr. FW’s delectable work. He puts a great deal of effort into preparing the feast and so it’s only right that we enjoy it on repeat. Anything remaining after six people have descended upon it with forks drawn is portioned out and frozen for future consumption by Mr. FW and me. This year, since Babywoods is due the day before Thanksgiving, we figured it’d probably be wise not to host… or make any plans for that matter. 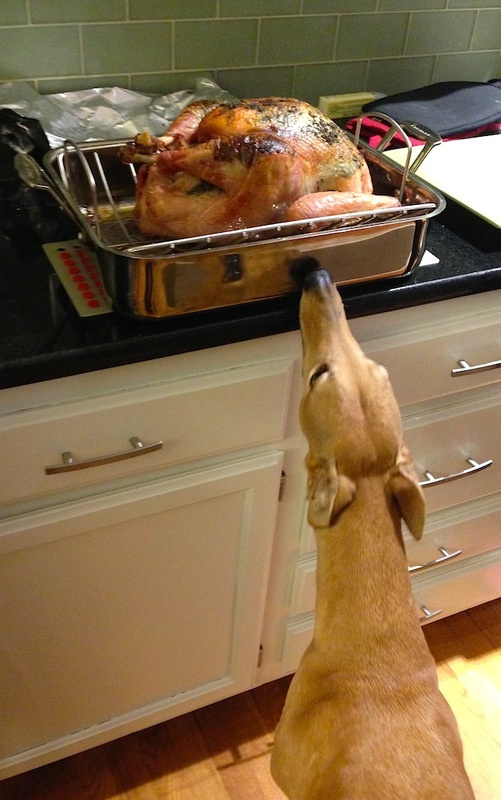 If she hasn’t made her arrival by turkey day, we’ll be cuddled up on the couch with Frugal Hound (ok, FH will actually be on the floor since she is, for unknown reasons, afraid of the furniture… ). Given our minimal plans this year, we commensurately reduced our menu to suit just the two of us. Basically we’re being little kids and only making our very favorite dishes: homemade cranberry sauce, sage sausage stuffing, biscuits and, of course, pecan pie (Mr. FW’s fave) and pumpkin cake (my fave). Since we could go into labor at any moment, we decided to jump the gun and have this mini-feast over the weekend and, oh wow was it tasty. Don’t worry, we’ll freeze most of those desserts for consumption at a later date, lest the hospital think I’m giving birth to a baked good. It’s entirely acceptable, and expected, in our culture to harvest the leftovers of Thanksgiving and people take pride in their creative recycling of the meal. But what about the rest of the year? It’s as though the leftover adoration inherent to turkey day is as ephemeral as an autumnal leaf… loosing its appeal as soon as the season terminates. I vote that this year, we all commit to loving leftovers every week. Treat each meal with the same reverence reserved for the Thanksgiving feast. Look with new eyes upon ye Monday meatloaf, ye spilt pea soups, and ye kale-y salads. Cast not aside these edibles that have given their lives for you–instead, eat them as they were intended to be eaten! I’ve heard all the arguments against leftovers: they’re boring, I already ate that meal this week, I’m tried of that dish… and I say FIE to them all! People, get over yourselves and eat your old food! Leftovers are nothing more than frugal weirdo take-out: pre-made dishes that you simply take out of the refrigerator and eat. What could be better! The notion that it’s somehow OK to allow food to languish and rot because we’re bored of it is tantamount to a frugal felony. I’m just saying. If you can’t stomach eating the same vittles on repeat for a week, there are several perfectly serviceable options open. You can freeze it in pre-portioned meal-sized segments for future munching (just be sure to date your containers and keep a list of frozen contents to prevent your freezer from becoming a food graveyard). Alternately, establish a meal-swapping system with neighbors or friends whereby you trade leftovers so that everyone has something new and exciting to feast upon. I’ve never actually done the latter, but it sounds fabulous–I got the idea from readers who tell me they adore the system. Sounds good to me! And if neither of these approaches appeal, consider the origin of the leftovers: after all, they came from inside your kitchen. Hence, it’s entirely within your power to prevent them from recurring by making smaller quantities in the future. Yes, it’s vastly cheaper to cook in bulk and yes, I highly recommend cooking in large batches, but if you’re consistently tossing an ample portion of those massive quantities of chow, then you’re not realizing the savings anyway. Simply scale back recipes to single servings. Ain’t no shame in that. Leftovers embody both the money spent to procure their ingredients and the precious time they took to cook and prepare. Not eating them means you’re missing out on the very richest fruits of your labor: the ability to take a night off from cooking and simply rest upon your culinary laurels. Don’t trash your laurels–indulge in them! According to NPR, “Americans throw away about one-third of our available food” each year. That’s a staggering amount of squandered resources, which manifests as a detriment to both the environment and our wallets. Individual consumers aren’t responsible for all of this food destruction–restaurants, farms, and grocery stores play a role too–but we the people are certainly not innocently standing by munching day-old celery. Mr. FW and I committed ourselves to not wasting food last year and, we’ve discovered that it’s an entirely feasible goal. Principally, we buy less food to begin with. We used to stock up on “necessities” because things we on sale or looked tasty in the moment. No more. We’re ardent list-followers and we only buy what we need. In the rare instances where life intervenes and we find ourselves with extra food, we either freeze it or give it away to friends. In my Buy Nothing group, it’s very common for people to give away food that they know they won’t be able to eat. I myself gave away a few cartons of milk not too long ago. For the most part, Mr. FW and I totally ignore food expiration dates. These are usually set artificially early and there’s typically nothing wrong with the food itself. We give it the ol’ sniff test and, provided it passes (which it always does), we eat it. 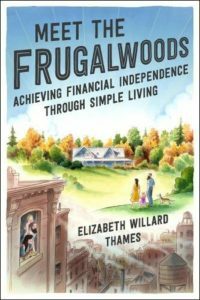 As I continually discover through embracing extreme frugality and making it my worldview, living frugally has benefits that extend far beyond the money we save. Saving ourselves time by consuming previously prepared foods. Mr. FW and I are blessed beyond belief to have access to mountains of healthy food easily purchased at a clean, safe grocery store a mere few miles from our home. But not everyone is so fortunate. The ability to obtain food in one’s neighborhood–let alone afford it–is a profoundly privileged position. Many people live in proverbial food deserts where nourishing food is nearly non-existent, or the cost of it is prohibitively expensive. This Thanksgiving, while expressing gratitude for the myriad freedoms we enjoy in our country, let’s remember that the very food on our tables is worthy of our deep appreciation. The embarrassment of riches that Mr. FW and I have in our lives: clean water, shelter, love, warmth, and food are not universally held rights. Reminding myself of just how fortunate we are is an important lesson for me to internalize now and always. So don’t waste your food, honor it and give thanks for it. What’s your favorite way to repurpose leftovers? Please share your tips! I am with your hardline on this. “Waste not, want not” is my kitchen slogan. I’ve found it really hard to avoid all food waste since having kids, so sometimes I serve myself less food and then eat the kids’ leftovers (with a hiatus during flu season). I regularly convert vegetable scraps & chicken bones into a delicious broth, which oddly enough my husband loves even more than leftovers. We also compost remaining vegetable scraps. I bet you could get a local gardener to take food scraps off your hands since you don’t have a yard. Amen on eating the kids’ leftovers. The other danger is to my waistline from clearing her plate. I’m trying to be like you and serve myself less off the bat – I can always go back for more. Mine is 4 years old so we’ re getting a better handle on how much is enough food to serve, but not too much. Still, we waste way more than I’d like. I also agree that it is hard with small children. Toddlers are the worst – you can minimize it by giving small portions, but I’m not sure you can avoid it entirely. I also agree that it gets better as they get older. My five year old is pretty good at eating what’s on his plate and even my three year old is so much better than she was a year ago! Smart tip to serve yourself less and eat their leftovers–I am going to file that one away for future use! This is a a gr8 idea. When my son was little, I didn’t want him to have a weight problem like I had so I emphasized stopping when he was full and wrapping up leftovers, no matter how small. It worked and he will not eat if he isn’t hungry and is a healthy 17 year old! Many years ago, I used to disregard the value of food and cooked in excess. I did everything you hate with regard to not eating leftovers. I don’t remember exactly when, but I started “this minimalist experiment” and started making enough for just me. It was trial and error in the beginning, but not only did I control food intake, but eliminated leftovers. What a relief it is to de-clutter that part of my life. No leftovers. Ever. When family makes holiday meals, I am so mindful not only of what I put on my plate, but what I bring to the table to share. In my opinion, it’s not a positive thing to display so much food that they are leftovers for more than a day. To me, it’s wasteful. I fully agree, and do not waste food ever. Really, a few onion skins, egg shells and the like is it. I buy very little processed food, so it isn’t that hard. And like so many, much of what I could is better the next day or whenever. A tip ere for the holiday> Save the turkey carcas and use it to make stock. I do this with chickens, when I get two-three carcasses I make a batch and freeze it. I make sure to use the heart and livers as well in the stock, as they are nutrition power-houses. That’s wonderful you’re in the zone of not wasting food! I find it really is a habit like anything else. Once you get into the rhythm of not wasting, it just becomes your normal routine. Good call on the carcass reuse! Best of luck with Babywoods – I hope she makes her appearance for you sooner rather than later! I went 10 days past my due date with little miss and I remember every day at the end of my pregnancy feeling like an eternity lol! I love leftovers, especially Thanksgiving leftovers! Totally agree with this. When one of my sons was at primary school (he was about 7 years old), they were learning about food groups etc. When asked for his favourite food – he said ‘leftovers’ !! I wasn’t sure if I should be embarrassed about this or not. His reason is that often with leftovers, people are grateful if you take as much as you like as they want the food used up. He also loves cold roast potatoes. That’s adorable–your son has the right idea :)!!! I am totally onboard with this and have actually lost a friend (well, ended a friendship) over just this issue. I know! Each to their own, judge not… etcetera. But my mum was a ration book, war child and the very idea of wasting good food is anathema to her and to me. I happen to live in a country where actual starvation and grinding poverty is not uncommon, and where available decent food is not a given in many, many households. Thus, when I watched an erstwhile friend … this actually hurts me to type it… gather up a big roasting tin FULL of gorgeous left-over barbeque meat and… throw it in the bin ”we never eat left over barbeque” I actually screamed. It is a despicable, selfish, revoltingly short-sighted way to behave. You could literally walk outside or go a little way down the road and people would be fighting with their fists over that food. But no. Throw it in the bin. Anyway. We very rarely throw away food unless there is literally no other option… I tend to carefully seal up, label and freeze and then re-address later. Waste not, want not… and I’m a total atheist, but that is a rule that holds so true! Oh that would pain me as well to watch someone throw out perfectly good food! As you said, even if you don’t want to eat it yourself, give it to someone who will eat it. I am laughing about the food borne illness because my husband picked up a horrible case of food poisoning at lunch on Friday (was so sick he ended up passing out). So I do think people have to be careful. We actually plan 2 leftover nights for dinner to help us make sure we are eating them. If we were to cook a big turkey say for the 2 of us, before we do, we plan a few different leftover dishes. One week we had turkey 7 different ways. It was a fun challenge. Happy Thanksgiving and I hope Babywoods arrives soon! I’m convinced that leftovers of any kind taste better the second time around. In my family, the day-after-Thanksgiving is the occasion for preparing turkey soup (much of which is portioned out and frozen for quick lunches or dinners). On the day after Christmas, I make an amazing beef and barley concoction. And there is no need for a trip to the market for ingredients because I have them all in the refrig or in the pantry. All in all it’s recycling with a yummmm factor! Happy Turkey and leftovers, everyone! Yum! 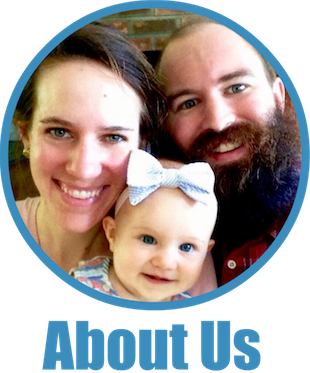 Sounds like you and your family have the right idea! Its funny, I was just thinking I wish we had bought a bigger turkey,, because I don’t think we will have enough leftovers for my leftover plans! I do not enjoy cooking (understatement of the year! ), so we consume a lot of leftovers in our house. I work them into my weekly meal plans, and try to schedule them for days when I’m working, or have a late afternoon or evening commitment. Last week I made a tray of turkey and artichoke stuffed shells (Giada DeLaurentis recipe). We had them for dinner three nights, and I had them for lunch one day. Between not wasting money and not having to cook every day, leftovers are a win-win for me! We eat leftovers all the time. I call my husband “the garbage can” because he even finishes the kids plates so we don’t waste food. Plus, I really (really!) don’t like cooking, so I’m always happy to re-heat something already made. I will usually make sure I cook enough for at least 2-3 meals, so it gives me a cooking break the next day. I don’t get people that just “get tired” of food and throw it out. My mom does that, it drives me nuts. And I tell her all the time to give it to us instead, but she doesn’t listen… Oh well. Totally! Leftovers are such a wonderful way to get a night off from cooking! We love the traditional American food that comes with Thanksgiving because we don’t make it very often during other times of the year (Asian, Mexican, and Italian favorites are our staples). As a result, we don’t mind chowing down on the same T-day leftovers for days. We have a strategy to deal with the eventual boredom that comes from eating turkey day after day. On Thanksgiving day as we’re putting up leftovers, we go ahead and freeze what we don’t expect to eat in the next few days. Turkey and mashed potatoes freeze especially well. Then we have “Thanksgiving in December” when we pop a bag of turkey and mashed taters out of the freezer. And “Thanksgiving in January”, “Thanksgiving in February”, etc until our stash runs out. This year we’re trying something new. We bought 2 20+ pound birds instead of 1. We’re hosting close to 30 (come on down if you aren’t 9 months pregnant! 😉 ), so around 2/3 of the first bird will be eaten or taken home as leftovers by others. But we’ll have a whole bird all to ourselves, which will get cooked, portioned, some eaten, but most frozen intentionally for more delicious turkey leftovers. Excellent ingredient in turkey salads, on sandwiches, in soup, in chili (yes! ), on a taco, etc. And it’s the perfect answer for “we’re busy tonight and there’s nothing to eat in the fridge”. Defrost some turkey, add a side or two and -boom- instameal. Great idea on the extra turkey! My mom usually does that as well. If you’re cooking one, might as well cook two (I apply this philosophy to all of my dessert baking, btw… 😉 ). Good luck with hosting! I am such a leftovers hater. I try very hard to leave exactly 0 servings of food when I cook (except for items which can be creatively restructured into new meals). My husband jokes that I’m going to make him fat one tablespoon of no-leftovers at a time. The problem that people have with “recycled food is they approach the whole idea wrong. You have addressed this issue beautifully. I love steak but to eat it day after day is so boring. However if some of the leftovers can be frozen in lunch size portions, that works. Then in addition I serve other foods in between the leftovers. For example: Spaghetti for day after Thanksgiving. Then Turkey Pot Pie. Next day Tacos, Followed by Grilled turkey Sandwiches, followed by Sausage/egg casserole (can use up some sausage dressing in this recipe without anyone noticing,) Then Turkey soup where you use up any leftover vegetables. I very rarely have leftovers. People think the refrigerator is the most expensive appliance to run they are very wrong!!! It’s the garbage disposal. Not only does it grind up your money, it grinds up the energy it took somone to prepare that fabulous food. Great Post! Buying less has been key to eliminating back of the fridge pre-composting. Although we eat all our meals at home, I only buy groceries for two or three dishes at a time. Somehow they always last 10 to 14 days. I try to use up all my produce before I buy more (onions and celery excepted). This requires lots of creativity at the end, but I have a few dishes–stir fry, Indonesian noodles–that showcase oddments. Growing up I cooked for eight, so we two often get four meals from a batch. Leftovers are a gift. Alas, we reduced food waste to the point that the worm bin died of starvation. That’s awesome re. the worms! We do the same thing with produce–no new until the old is all used up. And, stir fry is always such a good receptacle for dying veggies. is your sausage stuffing the kind with wild rice? that is my FAVORITE thing of all time and I make it for guests and work thanksgivings every year (and convert people to making it too, lol). I love leftovers. It always bothers me when people don’t eat leftovers too. My brother is the worst at not eating leftovers (he is bad about throwing away perfectly good items in general). He works a lot and his work covers $30 worth of food every day he works past 8 PM (most days) so he always has leftover take-out food in his fridge. Whenever I visit, I will often gorge on leftovers that would go to waste otherwise. I honestly think a big part of why many people in this country waste food, especially leftovers, is they have never truly struggled for food. Money may have been tight, but not that tight. Some people are just taught not to waste food and don’t need lean times to learn the importance of not wasting food. But for many people like my brother (who left the house before my mom became a child-support dependent single-mom), money has never been a serious enough struggle to affect their dining habits, or if it did, it’s been too many years since and they have forgotten the strugglin’ ways. And for lower income people who still waste food (like some other family I have who often have wasted food in their fridge too that I try to eat) I think an ignorance of their budgeting is partly to blame–many people don’t realize how much they spend on food each month and so the wasting cycle continues. And there are always ways to refresh leftovers—turkey fried rice, turkey salad, turkey quesadillas, turkey enchiladas, turkey and egg scramble, turkey soup… are just a few great standbys we use for leftover turkey in our household. Mashed potatoes can be frozen and used later with a binder to make potato pancakes. Most veggies go great with eggs for breakfast. I LOVE all kinds of stuffing so I eat that up first! Also, if people get sick of the leftovers, freeze them and date them. Then a two weeks later, they’ll be palatable again! First off- sending a prayer for safe delivery of your little turkey, Babywoods! I am an avid food user- upper. I also love leftovers. Married a man who doesn’t love them with the same vigor. My strategy has been to both freeze excess and/or repurpose the food in a different form to avert culinary boredom. Extra pizza slices get packed away as soon as we’re finished nibbling. Roast pork morphs into roasted sweet potato, pork, and cranberry “sautéed”. Veggies are added to inserted or eaten (mostly by me) for lunch. One of our biggest ways of staving off fridge waste is to keep the fridge relatively organized and keep leftovers in the clear Pyrex bowls that are also beloved by the Frugalwoods. Hooray for the pyrex bowls! We love those things. Many thanks for the good wishes and prayers for Babywoods! She’s definitely our turkey baby :). Leftovers, YAY! Thanksgiving is the gold standard for these, resulting in various soups, curries, sandwiches, mashed potato-stuffing remixes. I try to cook things we can have more than one night most of the time. Last week, for instance, I made some local ground pork patties ( with garlic, sage, rosemary and vermouth) out of 1 # of meat ( about 8 of these); some cornmeal griddle cakes; brown rice with veg and eggs sauteed together. Then, every evening, salad of arugula and mustards or sauteed b sprouts or cooked collards or mustards, still all fresh in the garden this weird warm year. So we can heat up whatever we want that night and have the fresh veg on the side. Last week was extremely inexpensive given how much came from the garden; you will have fun with this when you make the move to your homestead! I love how you refer to “we” going into labor. Yes, Mr FF will encourage you, but , honey, this will be the work of your life! Hope all goes well, just remember to keep breathing, and there is an end to the, uh, discomfort! I am even lazier than the FWs and don’t make lunch for the week ahead of time, that would be too much work. I just always make a little extra of whatever I am making for dinner and pack it up for lunch the next day. Thanksgiving leftovers are a whole other ballgame. My favorite is the Thanksgiving burrito. Before you say EWWW, it has nothing to do with imparting a Mexican flavor profile onto Thanksgiving food. I take large flour tortillas and fill them with all the bits of Thanksgiving goodness, then wrap them up and freeze them. To defrost them I take them out of the freezer and put them in a generously buttered frying pan and cook them, covered, super low and slow (30-40 minutes, just long enough for a refreshing happy hour beverage). The result is a crisp, buttery, flaky tortilla with filled with delicious Thanksgivingness. You can thank me later. I wasn’t even sure I was going to make the meal, but now I definitely am just so a can have the burritos and a turkey carcass for stock. Leftovers? Family members bring dishes so they can take home the extra stuffing, turkey, etc. I have to fight to keep some for the next day. I used to hate leftovers but then once we started focusing on our money and I saw the savings they provided, I quickly embraced them. We have an awesome turkey tetrazzini recipe that we love for the leftover turkey, so I’m always excited about it. The last few years we have done fried turkeys, though, and they were such a huge hit that we barely had leftovers for a sandwich let alone the tetrazzini. I hate food waste, so we try to get creative with leftovers as well. It helps to try to cook ingredients separate when possible. It’s easier to repurpose plain noodles or chicken that has only been cooked with garlic, salt, and pepper. I’m also a big fan of eating the same handful of meals every week. Another wonderful post. Using up leftovers is a great way to save on food and I can’t throw anything out without guiltily thinking of starving refugees and the hungry homeless. Planning ahead helps me deal with leftovers — and we often have them, since there are only two of us. Once a week I do a refrigerator/freezer inventory and plan meals for the week ahead, using up leftovers when possible. Often my hubby simply takes the leftovers for lunch, but if I can re-purpose into another meal I will. Some of my favorite ways to use up leftovers: In pie (chicken pot pie, beef pot pie, turkey pot pie), in soup (turned leftover roast beef into a delicious beef-barley soup last week), served over baked potatoes, in a casserole, or as a pizza topping (that last smidgen of pulled pork made an excellent pizza topping.) I also make broth from leftover bones and veggies, and I have a container in the refrigerator where I keep bits of vegetables and sauces to eventually go into soup. And then sometimes, we just have to gut it out and eat something that is less than our favorite in order to keep it from going to waste. I had carrot/ginger soup for lunch twice last week, even though it’s not my favorite. But it was nutricious and filling and it would have been stupid to throw it out. It always gets me how people say they don’t like leftovers. Perhaps they stink at cooking? If food is delicious at one sitting, how is eating it again somehow not delicious? Of course, some foods don’t reheat well, which I can understand. But most things taste pretty darn good (and some even better!) the next day. If you don’t want to eat something for multiple days, either make smaller batches or freeze some. It cracked me up last year when a colleague said she thought my lunches always looked delicious shortly after stating she didn’t like leftovers. Did she think I’d whipped up homemade pasta that morning? I also marvel at people who ooh and ahh over my homemade soup and bread (which I’ll make huge batches of in the crock pot, and the bread is no knead and I keep dough in the freezer. SO easy. ), then grumble that they’re tired of sandwiches. Their daily effort in sandwich making takes more work than my giant batch of soup did! Oh well. I’ll be over here nomming on my venison pastitsio in the break room. Can you please provide the bread recipe? I cook it for five minutes longer for the initial stage with the lid on the dutch oven. There are loads of no-knead bread recipes out there, but this one is our go-to because it’s simple and delicious. Enjoy! BREAD! I love Mr. FW’s homemade bread with all my heart. There’s really not much better than bread fresh out of the oven. I’m hoping maybe he’ll read this and make me some tonight… But I digress. Katie–“Perhaps they stink at cooking?” That cracked me up! Maybe so! We just gobble ’em. Most leftovers I just reheat in the microwave, and many wind up going to work with us. (I do have a toaster oven at work, which is nice if there is leftover pizza.) Big Brother is very partial to leftover split pea soup in his Batman thermos. Occasionally UNCOOKED food goes bad unusually quickly and has to be thrown out, but the only cooked food I ever throw away is, once in a blue moon, oatmeal. That doesn’t keep well. Thanksgiving confession: We are getting takeout. Last year’s turkey was an undercooked debacle, meaning that much of it DID get wasted. Mr. FP said he just didn’t want to cook, and it’s just the four of us. In the past we have sometimes skipped Thanksgiving, but that’s hard to explain to a four-year-old. So for $45 at King Sooper (AKA Kroger), we get a cooked turkey, gravy, mashed potatoes, stuffing, a green bean casserole, and 12 rolls. I’m not proud of it, but it’s not a bad deal. I have a friend coming for Christmas and I imagine we will make a bigger effort then. $45 sounds like a good deal! Enjoy that, my friend :). Ooooh, shoofly pie, yum. That is a Pennsylvania Dutch food. Where is his family from? Fellow Shoofly Pie lovers–yay! Mr. FW’s family is from the south, but his great-grandmother was PA Dutch and handed down the recipe to his mom and so it’s now synonymous with the holidays and family gatherings for us. We love those pies! Carissa–that’s so neat about your grandfather!! So neat! Did she live in PA? I never intentionally waste food and I’m pretty happy eating leftovers, but this year, I keep seeing something’s about to go bad and I think, ‘I’m not interested today, I’ll make it tomorrow.’ Well, then the next day I work late and the day after my SO buys a pizza, so ingredients go bad. My assumption was that I would just let cooked food go bad if I made something when I notice an ingredient on the edge, but It’s time to challenge that notion. Think I just came up with my 2016 new year resolution! Happy Thanksgiving and best of luck with Babywoods! Love this post because I can’t stand food waste! Seriously…it is a bit of a pet peeve when I hear people say…”oh I don’t eat leftovers.” Really?! Sure, I’m a bit of a weirdo in that I don’t really even care if I eat the same thing two days in a row, but to waste food really should be a frugal felony. You can always use the leftovers and remake it to something new. Thanksgiving is by far my favorite holiday. Mix tons of great food, with family and friends, some beer, and no gift-giving and you got yourself the best holiday out there. I’m not one of the people that can’t eat the same thing two days in a row – I love leftovers! Probably because I’m on the “see-food” diet 🙂 I’ve made some sandwiches the following days with turkey, stuffing, and cranberry sauce before! 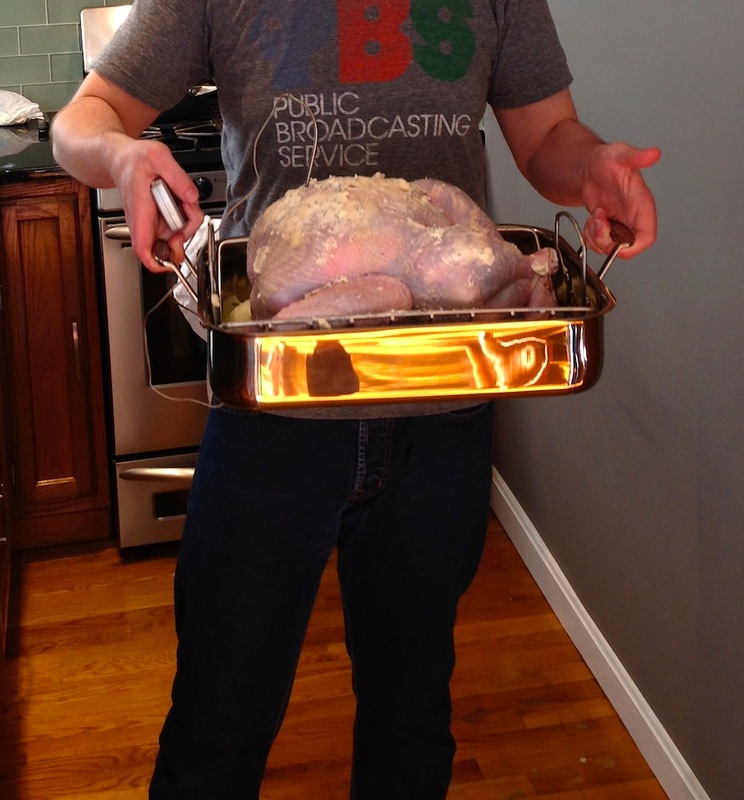 I bought a 22 lb turkey to cook and freeze the meat and make stock. I’m going to my son’s for dinner! If I end up spending $10 at Kroger, I will get another one. Can’t beat the prices for turkeys at this time of year. Wow, what a good and timely post! First, I want the brussels sprouts salad recipe. Anyway, I’ve always been fascinated by the whole food waste thing. And someone on some blog somewhere recommended the movie “Just Eat It”, available on Amazon. So, I watched it this weekend (it is not free with Amazon Prime, but I got a 29 day rental for $4). It was a pretty well done, and amazing movie. The main characters live in Canada (Vancouver?) and pledged to live on food waste for 6 months straight. This was anything from the food the husband’s brother was throwing out because he was moving, to produce/ food that was going to be “culled” at the grocery store, to produce at the farmer’s market that would be thrown away or composted, to dumpster diving. (Note, they did pay for the food at the grocery store, they just asked “what are you throwing away, we’ll buy it”. We have a little bit of food waste going on here this week due to the stomach bug. Anything not eaten gets tossed! I just eat what I’ve cooked and if we really get sick of it, toss it in the freezer in individual containers. You can put almost anything in a taco. While I’m with you on not wasting food I’m not necessarily with you on food pushed past expiry dates. I also believe some people are pickier not just by habit, but also by palate – of course enabled by a culture of plenty. I’ve got a sensitive palate that can distinguish when the milk is still good, but close to expiry date. I find some foods, particularly overcooked reheated vegetables and some defrosted leftovers, off-putting. I can also tell when less than fresh vegetables have been used in the first place and with some things this makes a significant difference. My solution is to not cook more than a dinner and leftovers for lunch in the first place (the turkey aside) and to shop every day for fresh ingredients and keep a kitchen garden. We don’t go to Costco often – only for a few items like almonds, pecans and Better than Bouillon. We live two blocks from two different grocery stores and I work from home. It makes shopping for dinner each day easy and I just pick out what is on sale. I read your rice and bean lunch recipe with interest, but I would not enjoy this dish more than twice unless it is cooked fresh again. There is a loss of quality for me when rice sits too long – or is frozen. Some things are just fine this way for me though – chili, soups, curries and spaghetti sauce.for example. I am; however, not so picky that I won’t eat what is served to me by others – I have no problem with this. We are also frugal in how much our family of six and a dog (who eats homemade food too) spends on food, but I spend more time than batch cooks do on preparing it. I’m okay with this because I like cooking but I can see that it wouldn’t be for everyone. In fact, when the kids were really little I did a lot more make ahead meal prep. I guess my point is that you can look at me as spoiled picky eater or you could view me as someone born with a sensitivity like others might have for scratchy fabric or loud noises which pushes me to spend more time on this. People with sensitivities can adjust when necessity removes options, but their quality of life would be impacted more than someone without that particular sensitivity. You might say who cares, stop coddling yourself. I say look around the world at food cultures. Many of the food cultures I admire the most are quite willing to spend more time on food growing, preparation and eating (Japan, Thailand, Italy, France, India), although this is shifting as time pressures mount. but you are definitely not spoiled or picky; you are the opposite. You do plan ahead very carefully, shop wisely and with thrift and don’t mindlessly just throw away food because ”I can’t be bothered”. Taking into account your taste sensitivities – and I do totally get these are real, we are all different and some people genuinely have very sensitive palates to not only taste but texture – you have organised your food purchasing and cooking beautifully. Sure, maybe it wouldn’t suit everyone… luckily it doesn’t have to! I think the issue with refusing left overs stems from people who just cannot be bothered to either eat or give away what they have made, nor are they willing to make less to take account. You sound really thoughtful and frugal, I’m sure everyone eats well in your house! I love to cook, but my husband and I have reached an age where it’s just too easy to gain weight. So lately I cook something yummy and full of vegetables (lately it’s been soups) twice a week and we happily eat leftovers. I also make a large loaf of homemade bread once a week, and we have thin slices of that with fresh fruit and veggies or soup. It’s a low-effort way of eating very health-fully. Leftovers are the majority of what I eat! I live alone, so usually when I do my weekly cooking, I make several portions worth, and freeze most of it. It’s fantastic to pull open your freeze and have it full of ready-to-eat foods you love! That sounds like a perfect system! Like some of the other posters, I like to plan for leftovers. For example, I was asked to make a pumpkin pie for a group meal. This means I’ll likely have leftover pumpkin puree and condensed milk. So, I’m finding recipes ahead of time to use those leftover ingredients wisely. I love left over Thanksgiving! 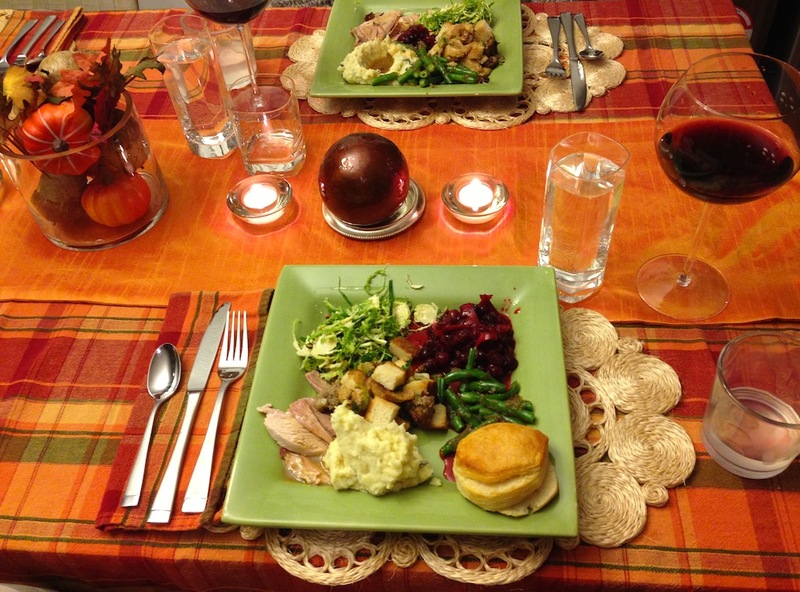 Take it from someone who has not had any leftover Thanksgiving the past few years, it is truly missed. We have been invited to attend Thanksgiving at family member’s households. This year we are hosting and I am looking forward to having left over Turkey sandwiches. Even when we host we end up cooking close to only what is needed so there isn’t any extended leftover planning to worry about or getting bored with them. Most leftovers tend to be around pies and other deserts due to everyone being too full to want much. I agree completely about leftovers! I especially abhor when my husband promises me he will eat the leftovers, so I put them in a container in the fridge, I even remind him to take them for lunch, and there they sit…forever…until they’re too old to consume. Managing my food better is definitely on my list of New Year’s resolutions for 2016 (starting now, of course)! Hello! I noticed you left out our family’s favorite way to deal with leftovers- use them as a base for tomorrow’s (completely different) dinner! If you are interested in learning more about that kind of cooking, there is no better place to start than Tamar Adler . She also writes for the NYT on occasion. She cooks up big batches of vegetables and meat at the beginning of the week, then repurposes them over the next 4-5 days in many different meals. So a braised roast becomes fried rice, hash, tacos, soup, etc. I don’t even want to tell you what magical things she does with pork belly! Great suggestions! Repurposing into a different meal is a super smart way to go–keeps it interesting for sure. I love Thanksgiving leftovers. We made chicken/turkey stocks using leftovers this year. It’s great. Great post! I’m actually looking forward to leftovers now. By the way, do you have a recipe for your pumpkin bread that you’d want to share? I’ve been looking to make some! 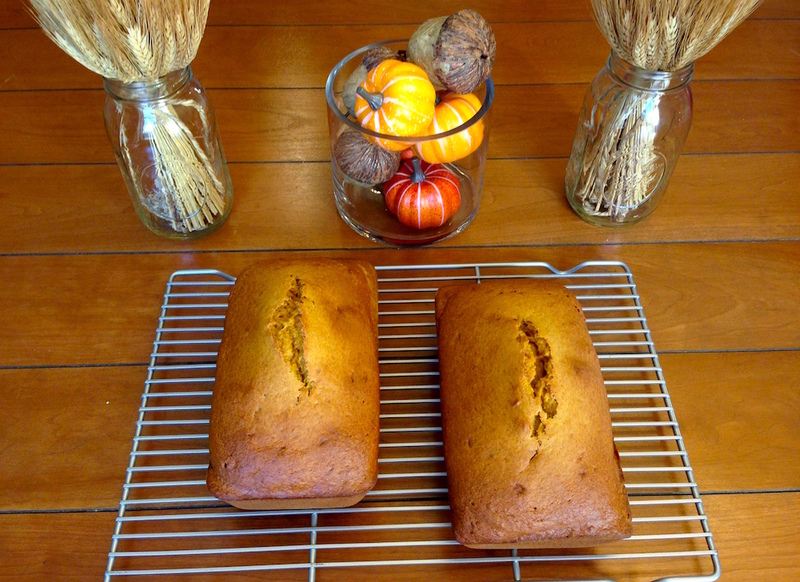 I used this recipe for the pumpkin bread and it was delicious: http://www.food.com/recipe/pumpkin-pie-spice-bread-2510. The bonus is that I froze some of it and it came out of the freezer beautifully a few weeks later. Enjoy! First time I’ve heard of Shoo-fly pie; research yielded something very historical. I learn something new from your posts everytime! Food waste is my and hubby’s pet-peeve as well. We actually love leftovers as they tend to become even more flavorful overtime and intrinsically, provide us with some much appreciated time-off from cooking! I think most folks simply need to be educated on “proper” techniques in reheating or jazzing up their leftovers for another meal so that they are not always faced with leftover-mush to eat (unless you have toothache then in that case, mush on!). Steaming versus microwaving (to prevent drying out the food further), lightly “baking” instead of microwaving, pan-frying instead of, you guessed it, mircrowaving can drastically affect textures and flavors, in good ways. Microwaves are convenient and quick, but it is often not the best tool to treat leftovers. 1. Never do we have to wonder or feel embarassed again if we should ask our server to doggie bag our “trivial” amount of leftover food anymore, we just pack it in our containers. 2. Along the same token of #1, we no longer convince ourselves and think, “Oh, I’ll just finish these last few bites so we don’t have to ask and wait for doggie bags.” even though we’re already full and are bound to feel uncomfortably stuffed (not to mention the mind-numbing effect of food coma…) after polishing everything off our plates. Some places offer very large portions! 3. It’s actually way faster and easier to pack our own leftovers than call the server over, explain our wants, and wait for our doggie bags before leaving the restaurant. Yes, bring our own containers and bag requires forethought but once it becomes a habit, no extra work is involved. 4. And how can I not mention the positive environmental bonus? Bring your own containers and bag and you’ve effectively diverted toxic plastic coated/lined/made take-out containers and bags from the landfill, incinerators or our oceans. We invested in a handful of airtight, watertight stainless steel containers as they are light weight and virtually indestructable. Nevertheless, glass containers are good alternatives as well. We felt self-conscious at first in using our own wares at restaurants, but have realized that what others think is inconsequential in comparison to the positive consequences of our actions and our love for wildlife and nature. Whether we get interested looks or not, we now adroitly whip out our nifty containers at the end of our meals and pack our leftovers away without fuss. If we’ve inspired just one other person to emulate our “strange” actions, then we’ve done some good in the world. What’s better than living by our convictions, save money, time, the environment AND our waistlines? ???? Thank you so much for reading my long comment, Mrs. FW. Personally, reading your posts is analogous to hearing from a kindred spirit. Sharing your beliefs jumpstarts this vital food discussion, furnishes a channel to suggest best practices and be reminded of all that is good and well in our lives right here, right now. Whatever imperfections exist in this moment, there are still plenty to be thankful for. Thank you for the wise words. And Frugalhound cracks me up! He (?) is adorably curious and calm in photos! That is a wonderful “doggie bag” system, Natalie! I love it! Totally makes sense and, it’s great that you’re then creating less waste by not relying on disposable take-out containers. Perfection. And, how wonderful it would be if other restaurant patrons copied your actions. Frugal Hound (who is a girl 🙂 ) thanks you! Carrying your own containers also means you can take food home from events! I’ve been to -so- many events where they had food, only to be begging people to take the food home at the end because they (understandably) didn’t want to throw it out. Now ,I keep a container in my purse at all times. So I’ll take home a few sandwiches, some fruit salad, whatever they’ve got left that I can re-purpose. People think I’m odd, but it’s at least one meal! My husband and I were biking to the store the other day and, just outside of our neighborhood in a pullout, there was a guy with a truck and a sign reading “Honeycrisp Apples $6/bag”. We love honeycrisp apples, which are some of the most expensive apples out there. (When we lived in Fairbanks, they would be ON SALE for $4.99/lb!) So naturally, we stopped. The guy ended up giving us two giant bags for $10! When my husband asked why they were so cheap the guy said that these were all the grocery store rejects. They had some slight imperfection that made them unworthy of the store. When we pulled the first apple out, it actually took a bit of searching to find the “imperfection”, a small divot near the stem. So glad the guy was out there selling them, rather than letting them rot on the ground. And I got to enjoy a lovely $.10 apple this morning with breakfast. The food waste in this country is despicable. What a great find! It’s terrible how much produce is wasted solely because of its outward appearance. I agree with you, despicable. I don’t ever think of the excess food I produce in my own kitchen as ‘leftovers.’ The term itself is a bit distasteful IMO so I guess I’m not surprised that it has a negative connotation with some. I just like to cook in bulk! The food we don’t eat the first time around has not been carelessly left or cast off but was simply designed to be eaten on a subsequent day. I much prefer to cook more food than we’ll eat in one day to save labor in the future! Sometimes I feel like all I eat is leftovers. I know I cook. I definitely cook. But day after day, I’m eating these leftovers. They must have appeared one day. Not all food is leftovers, right? There must be an original food. Leftovers must be left over from something. But lately all I see is leftovers. I eat them, and sometimes I put an egg on top. also, anyone ever worked in a restaurant? You better believe if there is leftover something or other it makes it’s way into tomorrow’s quiche or Wednesdays soup or whatever. Also, things were often reheated and sold for multiple days. (I can’t speak to like Michelin starred places, this was a nice little lunch place I worked at) People who have this insane “leftovers aversion” don’t really understand how much of what they eat at restaurants might be considered, gasp, leftovers. That said, old salad is the worst. I am careful to not ever dress too much salad cause I will throw it out. I often prepare and undressed salad at the same time I’m making my salad for dinner so I have a nice fresh one assembled for lunch the next day. I like the gladware with the little salad dressing compartments a great deal. Also, as so many people have mentioned, your freezer is your friend! Freeze that half container of broth you might not get to in the next week or two. Buy Costco butter and freeze the extras. I’m interested in this whole freezing milk concept but haven’t gotten there yet. My mom used to freeze cartons of milk when they were on sale and it seemed to work fine. I haven’t tried it myself though. Someone else here may have more experience with it. I’ve frozen milk. You need to open the container and pour a little out before freezing it in the container, but the plastic milk container is fine for freezing. Let it thaw in the refrigerator and shake it before using it. I’ve also frozen milk in freezer bags. They were portioned for a bread recipe that I made, so I would just take out a baggie of milk the day before I wanted to make bread. If you make your own broth, freeze it in Ice Cube Trays, then put the cubes in big bags in the freezer. That lets you get as much broth as you need for whatever you’re making, while still freezing it! It’s worked really well for us so far. I, too, cannot bear to see food wasted. This is one reason I dislike going out to eat. I almost can’t enjoy myself for noticing all the food left on plates when other customers leave. Knowing that it will be thrown in the trash is so disheartening. We live on a farm and try to produce as much of our food as we are able. We know what a gift food is and what is involved in getting good food to our plates everyday so to waste it would be absurd. You may find, as we do, that chickens are excellent partners in the “no waste” lifestyle. What little food we might have leftover (like children’s food that has been warmed up one too many times, some garden cuttings, etc.) is enjoyed by the chickens who give us eggs in return. Best of luck with the arrival of Babywoods! I’m with you–I hate the waste of restaurants. Why don’t people take it home in a doggie bag??? I’ll never understand that. Good to know re. the chickens :). And, many thanks for your good wishes for Babywoods! 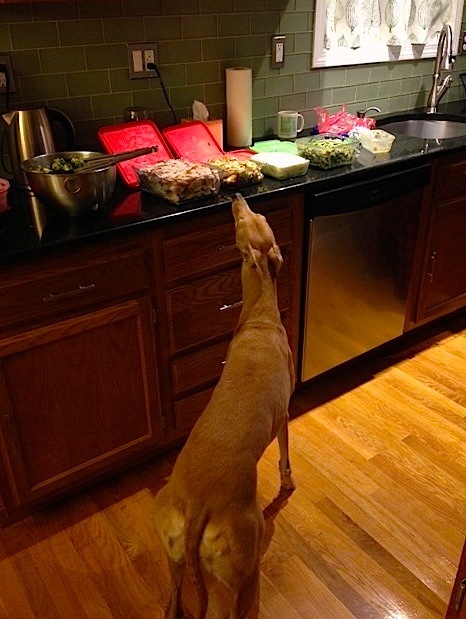 I love leftovers – especially T-Day and Christmas turkey. Yum! One year, my Mom and I strategically planned and cooked two 20lb+ turkeys for our large gathering. We had plans for soups, pot pies and stock with our leftovers. A helpful family member cleaned up after dinner and put the leftover turkeys out in the mudroom. Then someone put the dogs in the mudroom…and…well…no more turkey. 🙁 Luckily (and somewhat surprisingly) the dogs weren’t sick (cooked poultry bones are not good for dogs) but our leftover plans were dashed! You would hate being at my mom’s house! My father refuses to eat leftovers (I think this stems from his upbringing and the food not being so great to start with and being forced to eat it many times over!). However, my mother has always cooked like she is catering a party of 50 people! After every meal she would throw everything out (we were never even given the option to try it again the next day). It was awful. When I went on my own I was always careful to just make what I would eat and bought groceries every couple of days specific to my meals so everything was always fresh. When my hubby and I moved in together it was different because he could he 3 servings of something AND he would eat the leftovers. So finding a balance was key. There are still some things that I don’t particularly like as leftovers so I try ot be careful when making them. Luckily hubby will eat any of it! Hmm… love reading this post just after throwing away a completely uncooked, whole chicken 3 weeks past its expiration date… along with a bell pepper, cilantro and lettuce. (but to my credit I am currently boiling the tamarind as I write and the fresh cranberries and kale is still worth salvaging later this afternoon!). I recognize the shock value of this for Frugalwoods. It is for me too.. especially if you consider I only buy 12 chickens a year, always to be slowly roasted so that I might use the meat in casseroles and the bones for soup… I once calculated that (when executed properly in a timely way) we get 64 servings of prepared dishes from a single chicken (whoa!) and this month I blew it on those 64 servings… instead I’ve been using bouillon (which is at least better than buying all those boxes of prepared broth). Suffice to say I find your article today soberly shaming (as it ought to be). But I should have cooked that chicken. – We are not cooking Thanksgiving dinner: It’s only the 4 of us, 3 of whom are picky. – I will NOT shop for large amounts of food at a time. Although I might have a weekly plan in mind I will make the final menu decision the evening before or morning of. I’ll pick up the few needed ingredients at the Safeway that’s between groups of clients. I ride an electric bike and I have to ride past it M-F anyway. I read several of those NPR pieces on food waste and buying only what you need is probably one of the most helpful tips I took away from them (specifically it was the article about the couple who ate dumpster food for like 6 months or something). 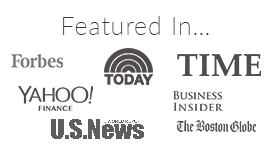 -Budget Bytes is your best friend in the frugal food world (it really is!). -Limit amounts of recipes and avoid adding more (recipes is form of consumerism: I used to waste a lot of time and energy picking out meals and creating menus when I didn’t have to). Keep things simple. I gave away all my cookbooks and saved only my favorite recipes in digital files (credit goes to Bea Johnson and her Zero Waste Home blog). Sounds like a fabulous new year’s resolution plan to me! Everything you outlined is what we’ve found to be true as well. Keeping our weekday meals simple and not buying too much to begin with are probably the top two factors in our war on food waste. Mr. FW will do maybe one or two complex dinner recipes a week and other than that, we have fairly simple meals with not too many ingredients. We used to run into the problem of being over-ambitious with meal plans and then they’d fall by the wayside because we didn’t feel like cooking for hours after a long day at work. And, don’t beat yourself up over the chicken–it happens to all of us! We are all SO EXCITED for Miss Babywoods! Prayers for momma and baby to be healthy and happy. One year my husband lamented “no turkey sammiches? !”, so I cooked another bird and we enjoyed that very much. Our new tradition is surprising someone at IHOP or the like. It’s the one time of year I can have pie or pancakes and give more. It’s SO FUN! I enjoy seeing your evangelical side! I have recently started disregarding the “best before” dates – but I certainly wasn’t going to tell anyone about it. Glad you do the same : ) Like everyone else, I wish you very well in the days (hopefully not too many) ahead. All the best to you, Mr. FW, and to Babywoods. Thanksgiving is such a perfect time for this little girl to make her entrance on the scene. Thank you so much :)! Yes, I’m a huge advocate for ignoring expiration dates–they’re largely mythical fairy tales in my experience. Why thank you ;). We do love our public media around here. I love this–there are so many fun ways to use up leftovers! Best of luck with your baby girl! I don’t really enjoy cooking, so i do it just twice a week. On Sundays I cook enough for the week, and then on Saturdays I’ll fix something different. Leftovers are my favorite meal! I’ll even double recipes to freeze extras. I can’t fathom cooking every day. Sounds like a great system to me! I am 100% in agreement on this. What doesn’t get eaten gets frozen. Scraps are composted or added to the dog food. We don’t throw food away at all. Ever. It’s my one hardline stance as well. I makes me see red when I see people throwing away full plates or containers of food. Congrats and good luck on the baby! We love leftovers, and I totally agree with your hard-line stance here. I was due on November 11 this year, but Baby Solly did not make his entrance until November 24 (8lbs, 9oz, apparently he appreciated all of those leftovers, too.) So we bought Thanksgiving dinner all made up from a grocery store. I don’t know that this was the most frugal option, but it was about $50 and should feed us for the next week or more. I hope your next post is a birth announcement! Huge congratulations!!!! How wonderful! So glad to hear that all went well and that baby is here!! Babywoods is certainly taking her time too–I suppose they have their own ideas about when they’re ready to join us :). And, your pre-made Thanksgiving dinner sounds like the perfect solution–not a bad price either. I hope you enjoyed your first holiday as a family of four :)!!! This post made me laugh! I am commenting after Thanksgiving so I’m hoping that Babywoods has made its/their save arrival and that mom and baby are doing well. I too am very adamant about not wasting food and eating leftovers. I am always stunned when I hear someone say”my spouse won’t eat leftovers”. How is that even possible?? Anyway, a few years ago the day after Thanksgiving a grocery store had excess turkeys for $5 each!! Needless to say I bought all I could store, 3 I think. I served $5 turkey for Christmas and bragged about it. My husband and I are also “famous” among family and friends for bringing home the turkey carcass from events that we don’t host. We cook off all the meat then make stock, soup and turkey enchiladas. We usually call the host who gave us the turkey and thank them and let them know how many meals we have prepared. It has become a fun and funny tradition for our family! Turkey Sandwich, Turkey fried rice, Turkey soup etc… My favorite leftover of the year. Turkey! Love the blog! Mind sharing your pumpkin bread recipe? I just discovered your blog, and it’s interesting that the first thing I read is in regards to leftovers. We actually like and plan for leftovers, using them for lunches for my husband and myself. And, oftentimes my high school sons will reheat something leftover as an after-school or after-football practice snack. Recipes please? We”re trying to have a frugal Thanksgiving. Last year we bought a ham and it has lasted till now (frozen leftovers) ham sandwiches, potato and ham soup, etc. Leftovers – turkey and mushroom risotto; ham and pea risotto. Also buy puff pastry and make a small amount of thick white sauce and add turkey, ham, onion or what have you and leave till cold. Make into plait (braid) – see recipes on line. Freeze what you don’t eat. Also pasta bake – almost anything can go in that! I always use the turkey liver in the sausage meat stuffing. Fry whole for a couple of minutes and then chop small and add to mix – tasty and nutricious! I would like your recipe for pumpkin bread. I have lots of self-grown pumpkin, a ow being a widow, I could make pumpkin soup and pumpkin bread and freeze it, I love pumpkin!!!! I hate wasted food and I was never disgusted as I had been went I went to in laws for Thanksgiving. There were 15 of us eating, but our hostess cooked enough food for at least 30 people. At the end of the night I walked into the kitchen and the hostess said to me” could you do me a favor and take all this garbage out” It was already wasteful enough because she doesn’t like doing dishes so everything was disposable and all the food was in disposable pans. She had a pan in her hands that had half a ham left and she was walking to the garbage can with it. I was shocked and asked was she really throwing it away. She said yeah because they don’t eat leftovers in her house. I said I’d gladly take it and she “sorry I wish I would’ve known, I already threw everything in the garbage and there’s just this ham and some desserts I need to throw out”. I’m going to admit something bad, because of all the food she threw away there were a couple of garbage bags with nothing but pans full of food covered with aluminum foil. I took out her “garbage” and it went home with me. I couldn’t stand to see all that perfectly good food go to the landfill.